We received a batch of MPx Throttle Body with spacer for the 03-05 Neon SRT4 the other day from our machinist. 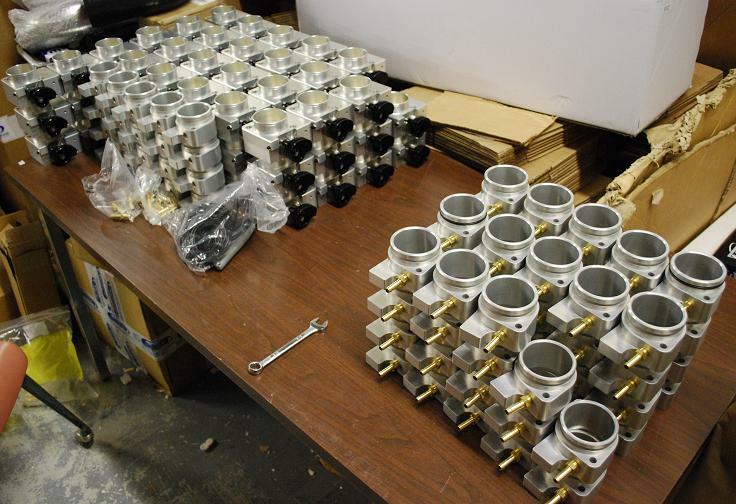 With each batch of the throttle bodies we get in, we do some final assembly, and quality test each throttle body to ensure perfect operation and fitment. This was a cool photo opportunity, so we snapped this photo to share with you guys..
Manufacturers LOVE using drive by wire Throttle bodies nowadays.. Comparison between 03-05 Dodge SRT-4 stock throttle body and MPx 62mm with spacer. Important note regarding MPx throttle body and spacer being installed on 03-05 SRT-4’s with stock computers..
We’ve got another small batch of HKS Limited Edition BLACK Blow off valves back in stock! MPx 60mm throttle bodies for 00-04 Neons back for limited time! Dodge Caliber owners – get rid of drive by wire throttle delay with Sprint Booster! New part for Dodge Dart 1.4 Turbo coming into stock shortly- MPx ported throttle bodies! Dart 1.4 Turbo/Fiat 1.4 Turbo owners – how about an extra 6-8 hp/torque and improved throttle response at the wheels? Tired of poor throttle response in your Dart/Fiat/Cobalt/Caliber? 2013-2016 Dodge Dart Mopar OEM lower control arms in stock! 2013-2016 Dodge Dart 1.4 turbo leaking from coolant hoses? We have the fix. Dodge Dart owners with problems going into reverse? Your reverse lockout cable is most likely broken. Dodge Darts with 2.4 benefit from the MPx catch can! Eliminate oil sludge in your intake manifold! Jeep Renegade owners with 2.4 engine – we’re working on a performance header for you!